On the fourth Friday of the #GreatReturnMarch Israel continues its criminal shoot-to-kill-and-maim policy towards the over 10 thousand Palestinians in protest inside the occupied and besieged Gaza Strip. Some 30 protests where also held in the occupied West Bank. Inside the Green Line, a mass demonstration denounced that “Your Independence is Our Nakba (‘catastrophe’ in Arabic)”. 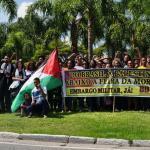 On April 10, about 100 activists from São Paulo and Rio de Janeiro held a protest against the 2018 edition of the LAAD, the International Corporate Security Trade Fair, which takes place this week in São Paulo. Known as “Fair of Death”, this is the biggest weapon trade market in Latin America and includes many Israeli companies as exhibitors.  On Tuesday, April 10, the Mexican Coordination for Palestine (CORSOPAL) and the #WorldwithoutWalls delegation handed over a letter from the Palestinian Stop the Wall Campaign to the Via Crucis March of Migrants as it arrived in Mexico City. 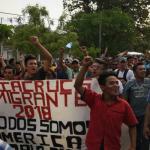 At the same moment that Palestinians in Gaza started the #GreatReturnMarch, migrants from all over Central America, in particular Honduras, started their march towards the US border, militarized by the Wall of Infamy. The letter highlights the connections between the people struggles as well as the complicity between the powers that oppress them. The Long March of Return in Gaza has continued last Friday. 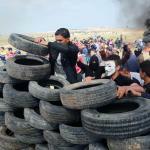 Another time thousands have joined the protest in the “Friday of the Tyres”. 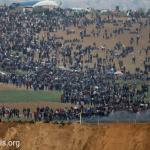 Again, of people from Gaza strip gathered in the return camps, tents set up at the border inside Gaza. Emboldened by the impunity the international community has granted to Israel after the massacre of our people in Gaza, Israeli snipers have continued to kill unarmed civilians. In the meanwhile protests have continued as well in the West Bank. Last Friday, Israel yet again used Palestinian civilians as guinea pigs in its weapons laboratory, testing its new teargas-firing drones against civilians in Gaza. The export of Israeli military technology, “field-tested” on Palestinians, contributes substantially to financing Israel’s oppression of Palestinians and military aggression against other nations. The BDS National Committee welcomes the recent resolution of the UN Human Rights Council calling on states to ensure respect of international law, among others by preventing arms trade with Israel. 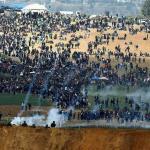 Today, Israel killed at least 15 and injured over 1200 Palstinians in the Gaza Strip alone. 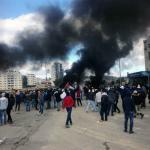 More were injured in protests in the West Bank while Palestinian citizens of Israel have lead huge protests. 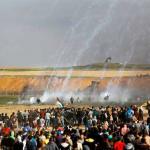 These unprecedented Land Day protests are the Palestinian response of resistance to the ongoing Israeli ethnic cleansing and colonization of Palestinian land and the US-Israel plan to solidify Israel’s grip on all of historic Palestine, just as the Nakba’s 70s anniversary draws closer. 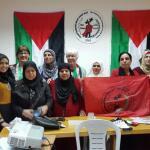 The Palestinian BDS National Committee celebrates International Women's Day, says "Justice is always a feminist issue. 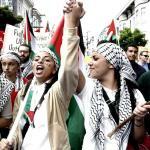 And in turn, justice in Palestine is a feminist issue, and the rights of women are fundamental to our movement’s pursuit of a safe, just and dignified world for all." 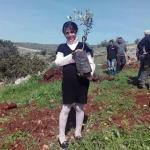 With the participation of dozens of villagers, the Stop the Wall Campaign have held a volunteer day for the cultivation of olive trees in lands near the apartheid Wall in the village of Faqu’a. 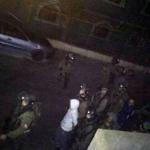 This morning at dawn, Israeli occupation forces have attacked the West Bank village of Nabi Saleh and arrested ten people - among which Muhammad Tamimi, who is still suffering from his skull injuries he sustained when shot in the head by Israeli forces two months ago. Sunday, February 24, two hundred Jordan Valley activists protested against settler takeover of yet more of their land in Israel’s attempt to ethnically cleanse the area. Settlers had in the last days occupied land of the residents of al Aqaba, close to the Israeli military checkpoint at Tayaseer in the northern Jordan Valley. 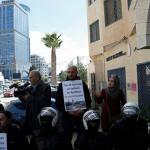 A group of activists has protested the presence of an official US Congress delegation, which had scheduled as part of their Israel trip a white-washing event Ramallah. Today, February 21, during a protest for the release of Munther Amira, coordinator of the Popular Struggle Coordination Committee, two young activists have been arrested as Israeli military brutally attacked the demonstration. Saturday, February 3, a Palestinian coalition started ‘Here we remain’ a new campaign against the Occupation in the West Bank. 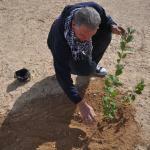 Activists from the Land Defense Coalition, in particular members of the Stop the Wall Campaign, Farmers Union, Jordan Valley Solidarity and the Palestine Youth Forum, gathered in the Village of Al Aqaba to start the planting of 13 000 olive trees. 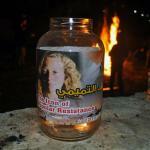 Yesterday, friends and relatives of Ahed Tamimi celebrated her 17 birthday in the Village of Nabi Saleh, West Bank. The family opened the house for friends, activist and also for the press. A cake with a photo of the young activist was distributed while kids played on the yard. The young activist was supposed to be put on trial on same day as her birthday but Ofar’s Military Court postponed the decision to 6 February. Last Sunday, members of the Palestinian Agriculture Society in Jericho gathered together with the local community to plant trees in An Nuweim, in the Jordan Valley. The objective of the action was to ensure the use of land and with this to prevent it from being taken over by the settlers and eventually confiscated by the Israeli authorities. This is part of the joint effort of the Stop the Wall Campaign, the Land Defense Coalition and the Popular Council for the Protection of the Jordan Valley to plant 13 thousand trees this year to protect the land. 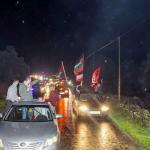 Israeli repression brings with it bitter-sweet moments of joy – the moment the community can welcome home an activist after imprisonment. 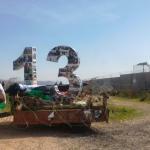 Today, Stop the Wall was able to welcome one of the Palestinian prisoners back home after 18 months of jail. 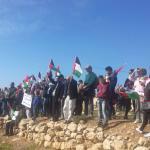 Protest in Nabi Saleh: We will continue to resist! 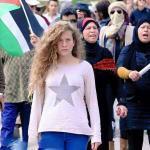 Today, some 1000 people gathered in Nabi Saleh in support of the popular struggle of the village and to ask for the release of its prisoners, in particular 17 year old Ahed Tamimi, who has been taken to prison with her mother after a video that showed her a slapping a fully armed Israeli soldier went viral. 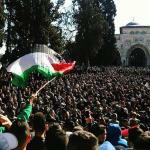 The day of mobilisation called for in Palestine on Friday has seen mass demonstrations all over Palestine. During the day, Israeli repression was heavy and killed two Palestinians in Gaza and left over 800 people injured. The day after Donald Trump’s ominous declaration arbitrarily recognising Israeli sovereignty in Jerusalem and the city as Israel’s capital, in all major cities of the West Bank people poured out on the streets in protest. 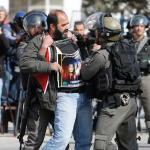 Israeli repression injured over 100 people. On the occasion of the International Day of Solidarity with the Palestinian People (November 29), the Ka’abneh Bedouin community in the Jordan Valley hosted a Day in Solidarity and to Support Steadfastness. 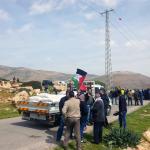 Thirty activists gathered to help the beleaguered community to finish the building of their local school, as a form of resistance to ongoing Israeli efforts to ethnically cleanse the area from Palestinian presence. South Africa, Brazil and Palestine: Apartheid is a world-wide issue when it comes to the control of non-white populations, when it comes to interests in land. It is a fight over ethnic and territorial supremacy.